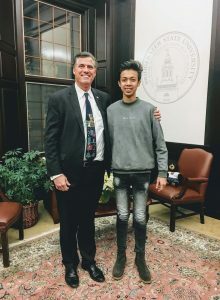 In August, Pagna, a 19-year-old EYC scholarship student, arrived in the US to begin his yearlong study abroad program as a political science student at Bridgewater State University (BSU) in Massachusetts. In the five months since his arrival, Pagna has seen and done many things he never even imagined before leaving Cambodia. While he misses many things about home including his friends and family, the food, and the warm weather (winter in New England is a challenge! ), he has been taking full advantage of the opportunity by diving into his classes and his new life in the US. In his first semester as a BSU freshman, Pagna took a diverse and heavy course load including a senior level class. To keep himself on track with his studies, Pagna has created a system where he outlines what he needs to get done for a project or assignment, breaks things down into individual tasks, and then rewards himself once he has completed a task or series of tasks. Rewards include cookies, a walk around campus, playing soccer, or, probably his favorite…an episode of “The Office.” Pagna’s hard work, and motivation technique paid off at the end of his first semester when he was rewarded with two B’s, one A-, and two A’s – a tremendous accomplishment for any freshman student let alone one whose native language is not English. For Pagna, school in the US is quite different. Aside from having to get used to doing 100% of his work in English, he’s had to adjust to a heavier workload and a more interactive teaching environment. In Cambodia, the relationship between student and teacher is more formal whereas in the US there is a greater degree of interaction both inside and outside the classroom. Pagna appreciates how the professors at BSU are willing to work with the international students, making sure that they understand the material, can participate in the class discussions and feel comfortable reaching out with questions during office hours. To strengthen his English proficiency and fluency, Pagna has incorporated some interesting resources including Engvid.com, which provides over 1,000 free English video classes covering lessons on vocabulary, grammar, pronunciation, culture, and more. To enrich his vocabulary, Pagna uses a website called Quizlit to design a process by which he can learn both the meaning and the pronunciation. 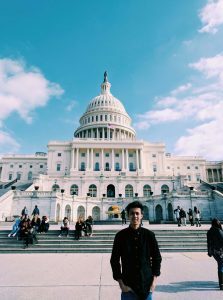 While Pagna is working hard at BSU, this fall he had the opportunity to explore Boston and travel with other BSU international students to Washington, DC. Over his winter break, he had the chance to visit friends of EYC in Massachusetts, Vermont, Texas, Arizona, and California. Among other things, he toured a cheese factory, visited a state legislature, took a “polar plunge” in a frozen lake, learned how to play Rummikub with the “Yoda of Rummikub”, explored a presidential library, hiked along the Grand Canyon in the snow, and saw the Hollywood sign. Although Pagna knew a fair amount about the US before coming, the experience so far has been more than he imagined. He has been particularly surprised by how open and friendly people have been, and he is very grateful to everyone who has opened their homes and hearts to him. 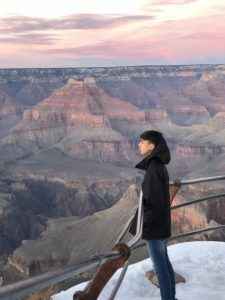 His life will be different going forward due to this experience, and he wants to encourage other EYC students to pursue opportunities to study abroad. To prepare for such opportunities, Pagna intends to urge his fellow EYC students to build their leadership skills, get comfortable expressing their ideas, learn about other cultures, and take advantage of practicing English with foreigners. He says that it is important to prepare in Cambodia before going abroad so that you are not frightened or intimidated by living in a different culture. 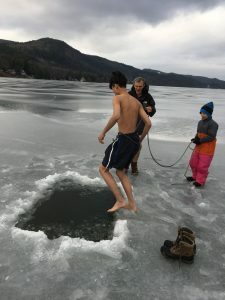 While many differences exist, Pagna has adjusted well into both life and school in the US and is looking forward to the adventures that await him during the remainder of his time in the US. next post: EYC Sports Coordinator Featured in Phnom Penh Post!